You are here: Home / About Andrea / Oops! Friday the 15th of August at riding, Chester and I were headed back to the barn when my helmet needed an adjustment. Susan, my side walker, pushed it up a little using the brim, and it cracked! I had been planning on purchasing a new helmet this winter, as my helmet will be five years old at that time. 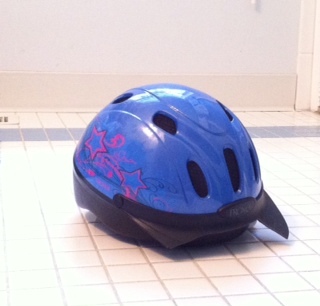 The life time of a helmet is five years. Needless to say, I need to buy a new one now. By the time, I had dismounted, the cracked brim had fallen off! So, a shopping trip to The Tack Trunk was planned. Ouch! Happy it was the helmet and not you! I know you have loved this helmet! Maybe you will find another just like it. 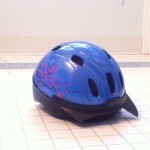 I love this post because it teaches me about riding helmets and where I can consider purchasing one! Thanks Andrea! Please send a photo of you and your new helmet…and that smile of yours which makes me smile!